Happy Monday! Wherever you are, and whenever you may happen upon this article, I hope the topic is timely. This blast from the past, originally posted in 2007, is as fresh as ever. 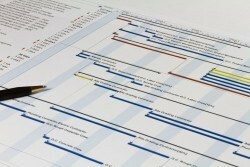 It deals with the perennial topic of big-time project management task calculations. I’m helping a couple new clients grapple with this age-old issue and thought it might be useful for others as well. Enjoy! What is the “Task Wrapper” or “task multiplier” in a big/enterprise IT Program? The wrapper multiplier is known by many names: organizational wrapper, effort multiplier, task overhead, etc. Names may vary, but the concept is the same: any task or group of tasks, within any plan, have an intrinsic time value plus some unit of organizational overhead required to complete the task. As a general rule, high multipliers (making tasks take longer than they need to) are bad for a project budget, low multipliers are good. Once the intrinsic task time (4 hours) has been calculated, the task wrapper is calculated by applying some arbitrary, or pre-calculated base multiplier to the original task. The degree or size of the multiplier is entirely dependent on the type of organization, and its unique system of people, processes, and politics. In general, the more inefficient and “top heavy” or “political” an organization is, the higher the multiplier. As a rule, task multipliers are directly proportionate to the size and complexity of the organization – but not always. Small organizations are not exempt from the ranks of the inefficient. Intrinsic Task Time (4 hours) X Task Wrapper (5) = 20 Actual Task Hours. guess based on experience with high overhead organizations. One organization may have a much higher wrapper (typically the larger, or more complex organizations); other organizations may have smaller multiplers. Task multipliers can be any value, positive or negative. The challenge is that the actual multiplier may conceal itself across multiple project plans and resource personnel. In that case, you may need to hunt it down in your organization’s project management organization (PMO), or other places. What is included in the task wrapper? close your projections are. Better yet, find someone else’s project within the organization do a couple dry run tests on your task wrapper numbers. Adjust up or down as needed. wrappers can also be negative numbers, and adjust tasks downward. And honestly, it can be tough to sell reality to anxious stakeholders. Still, I think it’s worth it in the end. Better to be up front and honest, then to be that “yes” man or woman who tries to appease and ends up with a failed and over-budget project. How do you “keep the wrapper”? What tips or strategies work for your projects? Do you get pushback, or do clients appreciate the “task wrapper” honesty? Be heard in the comments below. In the meantime, stay tuned for Part 2 of this series, when we talk about calculating a budget in the IAM or Enterprise IT worlds.